Nestled in Metrowest Boston, just an hour drive away from downtown Boston, Groton is one of New England’s hidden gems. With its riverfront location and scenic backdrop, this small historic town is the perfect choice for those who want a quaint and quiet place to lay down roots. 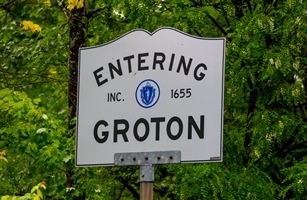 First settled by various indigenous tribes, the Groton area has been in use for thousands of years. It wasn’t until 1655, however, when English colonists arrived, that it was officially named and incorporated. Soon after, the town played a role in King Philip’s, King William’s and Queen Anne’s wars, and the town’s First Parish Church (which still stands today) served as an assembly area during the Battle of Lexington and Concord. The town of Groton has had a storied past to say the least, but it’s the area’s future that’s of real interest. In the last century, Groton has more than quintupled in size, now housing nearly 11,000 residents. And since 1940, the town has grown by more than 10 percent every decade – some years, even clocking in at 20 and even 30-percent jumps. It’s not just the town’s population that has grown either. Residents now have more amenities to enjoy than ever. In addition to soaking in all the beautiful scenery, natural surroundings and amazing riverfront access the town has to offer, Groton residents can also enjoy the public library, country club, golf course, recreational sports leagues, various trails and parks and any number of the town’s hundreds of clubs and organizations. As far as communitywide events go, Groton is abundant with them. From Civil War reenactments and annual parades, to Christmas tree lightings and other holiday gatherings, the town offers family-friendly activities month after month. For horse lovers, Groton also plays host to the National Shepley Hill Horse Trials, an annual equestrian competition and event. Groton is overflowing with educational opportunities, too. The local public school district, Groton-Dunstable Regional, has an extremely high success rate, with 90 percent of its graduates attending college upon graduation. For a more tailored educational experience, private schools like Groton Community School, Country Day School of the Holy Union, Lawrence Academy, Groton School and Lowthorpe School of Landscape Architecture offer plenty of alternative options. Though a place with such opportunity and consistent growth might seem like a far reach for some, many real estate seekers are pleasantly surprised with the affordability of Groton, as well as the real estate options it provides. The average price of a home in Groton runs in the low $400,000s, though a mere $200,000 can cover a modest 2 or 3-bedroom condo in a great area. Larger, more expansive estates can run upwards of $1 million. But don’t let that scare you away. Options in all prices ranges are available and abundant. Full of lush landscape, a bevy of sought-after amenities and a rich history few American towns can boast, Groton is truly a site to be seen – and lived in. Come see the magic of Groton for yourself. You won’t regret it.